- If you want to buy this item, please, contact us by our information form or via e-mail. Then, we will provide you the order information (price(s), shipping charges, payment methods and availability of the item). If you decide to buy the item, you have to confirm us your order (by filling the order form ) and next, you may arrange the payment by a bank transfer or an online payment by credit card *. by clicking on it you will open a payment page; there, you have to type in the space "Unit Price" the final price of purchase we sent you by e-mail and after, click on "Update Totals" for proceeding with your transaction. 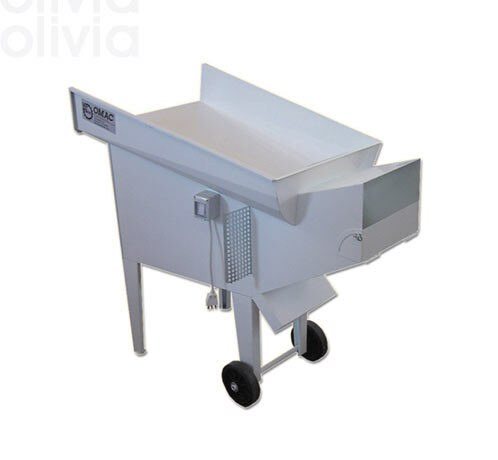 OLIVIA electric olive leaves remover, has been designed to statisfy small and medium oil makers requirements. The operation, simple and essential, consists in taking advantage of ventilation action created by motor: in this way, we can obtained cleaning of every kind of olives. Machine is provided with a simple dismantled grid, so that it is possible to use this machinery fo cleaning beans,chickpeas, broad beans, wheat, etc.